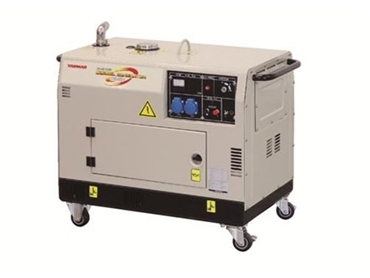 Power Equipment - Yanmar announces the launch of a new range of silenced portable power generators. The smallest in their range of portable generators, the compact Yanmar eG55 is part of Yanmar’s next generation of small and silent gen sets in the Australian market. Yanmar eG55 portable generators are powered by Yanmar’s single cylinder L series air cooled diesel engine with a maximum output of 5.1 kVA (standby at 50Hz) and operating at 3,000 RPM. At continuous 100% load, the noise level at 7.0m is a very acceptable 73 dB, with the cabinet’s soundproof isolation material further aiding its quiet operation. According to Noel Heritage, Business Manager of Power Equipment, the Australian agent for Yanmar, the new Yanmar eG55 is particularly suited to domestic applications where power supply needs to be supplemented, either as a diesel backup for standalone solar power systems or when mains outages occur. Power Equipment is the exclusive and authorised Australian, New Zealand, Papua New Guinea and South Pacific distributor of Yanmar marine and industrial diesel engines, JCB DieselMax, MASE diesel marine generators, Gori high quality folding sailboat propellers, PSS shaft seals and Electromaax products.